Michelangelo Merisi da Caravaggio was an Italian painter who was born in Milan in 1571. His father, Fermo Marisi, was an architect-decorator, while his mother Lucia Aratori came from a family who owned property. 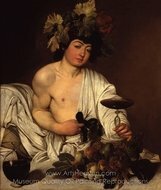 Caravaggio paintings are known for their realism, much of which stems from his history and lifestyle. After a plague swept through Milan, the family moved to the town of Carravaggio when Michelangelo Merisi was just 5 year old. His father died there just a year later. His mother lived until 1584, which was the year he began a 4-year apprenticeship with Simone Peterzano, a painter from Milan. Caravagio spent most of the time following his apprenticeship in the Milan-Caravagio region, although it is possible that he spent time in Venice where he would have been influenced by the art of Giogione. He would also be influenced by the great artworks of Milan which included Da Vinci's Last Supper. Caravaggio would leave Milan at the age of 21 for Rome where he was said to arrive without any money, and apparently a penchant for brawling. It was here he began to paint a series of flower and fruit paintings strictly to make a living, in almost a factory-like setting. 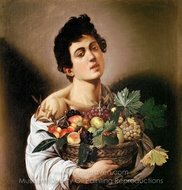 His earliest known paintings including Boy Peeling a Fruit came from this period in his life. Caravaggio left the position 3 years later, back on his feet, and ready to make it on his own. It was in this part of his life he formed important friendships with painter Prosperi Orsi and a young Sicilian painter by the name of Mario Miniti. Orsi was of course, already established as an artist, and Miniti would ultimately serve as an important model for Caravaggio. 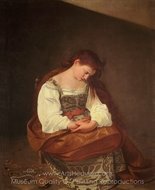 Caravaggio's The Fortune Teller was his first painting to portray multiple figures, showing his young friend Miniti being cheated by a gypsy girl. It was a theme that would be quite popular for 100 or so years after Caravaggio death but at the time, he sold the artwork for little money. 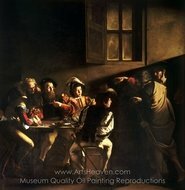 Many consider Caravaggio's The Cardsharps his first masterpiece. It again, featured a cheating theme, and was very popular. 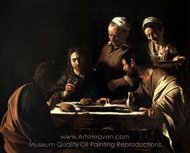 The painting was perhaps more important for Caravaggio in that it was appreciated by Cardinal Francesco Maria Del Monte, which led to Caravaggio famous paintings like The Musicians and The Lute Player. It also led to the creation of Boy Bitten by a Lizard , which again featured Miniti, this time with other young models. 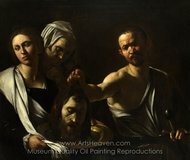 Caravaggio paintings turned to religious themes, created The Penitent Magdalene , Saint Catherine , Judith Beheading Holofernes, and Rest on the Flight into Egypt. 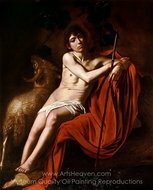 Caravaggio's naturalism and realism, which he is now famous for, was becoming very evident. In 1599, at the age of 28, Caravaggio was commissioned to decorate the Contarelli Chapel. It was two works associated with this contract, Martyrdom of Saint Mathew and his Calling of Saint Mathew that propelled the artist's career. 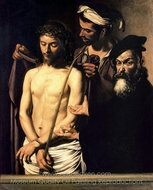 Caravaggio went on to obtain valuable religious commissions, many which featured violence, torture and death. It was around 1602 he painted The Taking of Christ. His popularity continued to rise, though some considered his realistic portrayal of some of his themes as vulgar. Other works include Entombment, Grooms Madonna, and Death of a Virgin. 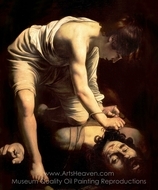 Caravaggio's brawling lifestyle eventually led to him killing a young man in 1606. Caravaggio then fled to Naples to evade Roman officials. His painting continued with Madonna and the Rosary , and The Seven Works of Mercy. After a few months however, Caravaggio traveled to Malta, presumably looking for help in obtaining a pardon for the killing in Rome. 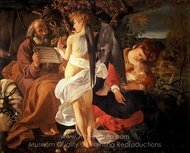 It was here he created the only painting to actually contain his signature The Beheading of Saint John the Baptist. Apparently due to yet another brawl however, Caravaggio was once again arrested, escaping now to Sicily. It is here he teamed up with old friend Mario Miniti went on somewhat of a tour together, where Caravaggio produced works like The Raising of Lazarus. Caravaggio was apparently being stalked and attempts were made on his life, so he returned to Naples. Here, one such attempt resulted is severe facial disfigurement for the artist. 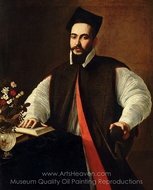 In 1610, he traveled to Rome to recieve his apparent pardon. Instead his death was reported. There is debate on whether his death was the result of a murder of if it was the result of lead poising, a common ingredient of paint in his day. Caravaggio died at the age of 39.